Follow this step-by-step for a tropical chevron design. 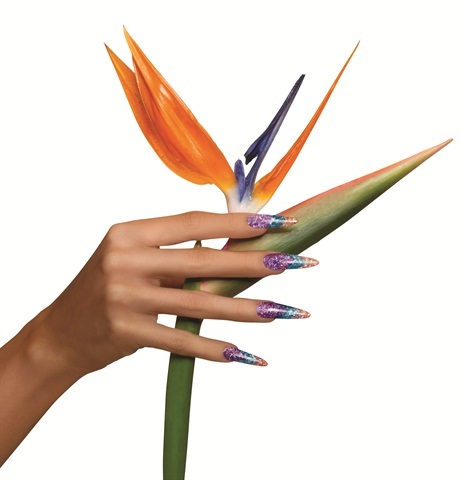 EzFlow’s Boogie Nights Paradise Cove collection features six multi-dimensional and highly-pigmented acrylic glitter powders. They can be layered for a look with intriguing depth or can be built up for opaque coverage. Follow this step-by-step for a tropical chevron design. 1. Apply an EzFlow Nail Form to the nail, making sure to pinch the end closed and angle the form downward slightly so the end point of the desired nail is in line with the nail groove. Using EzFlow Boogie Nights Lush powder, create a medium-size bead and place at the desired point. Work into a V shape and blend the acrylic back toward the cuticle. Apply a second bead below the cuticle to fill in for even coverage. Pro tip: Be sure to clean up the angles to create crisp, clean lines before moving to next step. 2. With Boogie Nights Rain of Days, place a bead below the first color and create another V shape following the lines from step 2. Pro tip: Be sure to clean up the angles to create crisp, clean lines before moving to next step. 3. Use Boogie Nights Feathered Fantasy for the final color. Place a bead at the end point of the nail and work upwards towards Rain for Days, creating a V shape. 4. Cap the entire nail with a polymer clear powder to build structure into the nail. Remove the form and mold the C-curve into the nail. 5. Using EzFlow Wild files, shape and perfect the nail starting with the White Tiger (100 grit) for preliminary shaping along the extension and switching to the Grey Wolf (150 grit) to file the surface. Refine the surface using the Grey Fox file (180 grit). Apply Finish It! No Cleanse Top Coat to complete the look.